I take a selfie on the road to Dover. 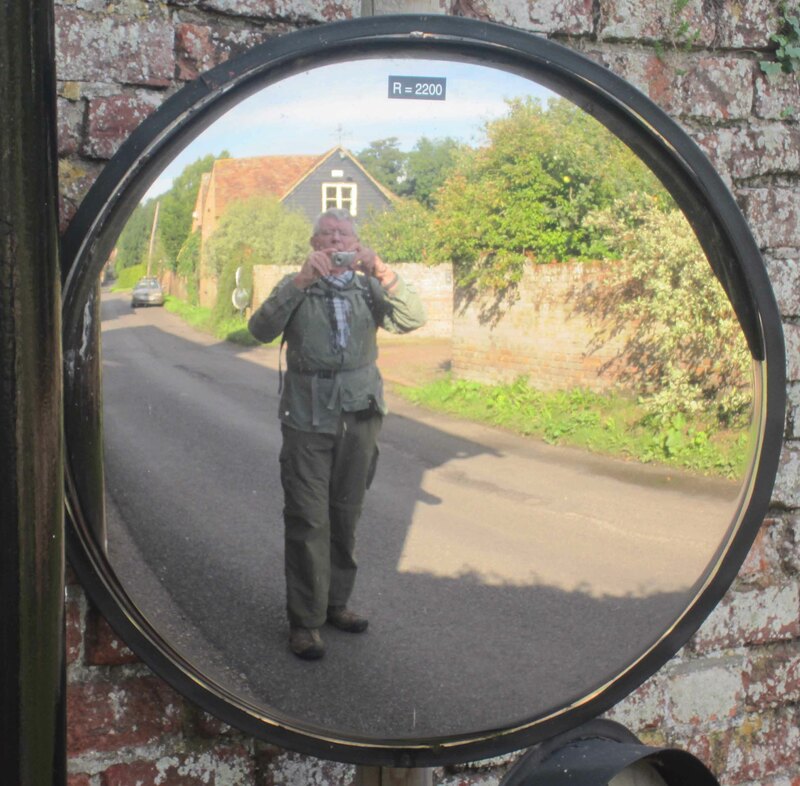 The mirror helps cars, and walkers, negotiate the narrow roads. An army marches on its stomach. Walkers do too. We found that breakfast was a key element in our daily routine. The morning of Thursday September 3rd began with breakfast at Augustines B&B in Canterbury. Over the preceding month Emmy and I had experimented with breakfast. We tried small continental breakfasts – a croissant with butter and jam, some yoghurt, and a cup of coffee or tea. 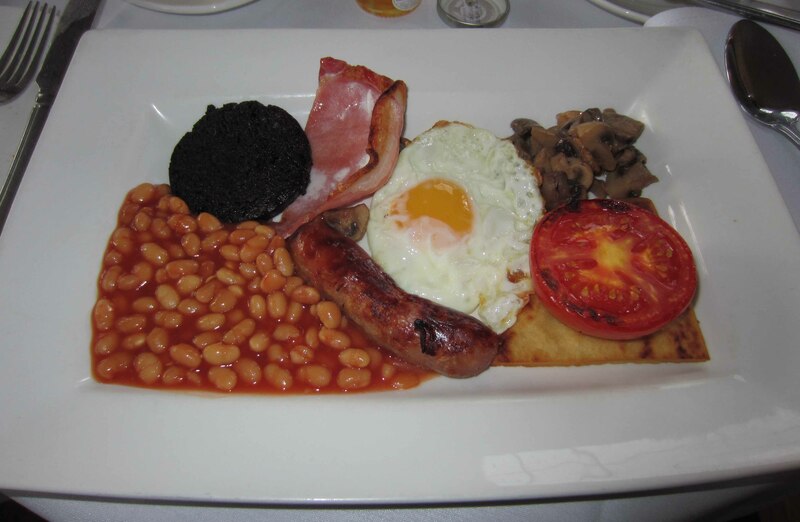 We also tried the mountainous full Scottish or full English breakfast – fried eggs, fried bacon, fried mushrooms, fried potatoes, fried tomatoes, fried sausages, baked beans, buttered toast and the piece de resistence, black pudding (fried, by the way). The continental breakfast did not give us enough ballast to hold course for more than an hour or so before we had to drop anchor and eat. The full English/Scottish, on the other hand, sent us straight to the bottom of the harbour. It’s difficult to set sail from down there. So we hit on a compromise: muesli (or cornflakes) and fruit with scrambled eggs and button mushrooms. This was the tasty combination that Louise – our very attentive hostess at Augustines – served, garnished with chatter that lifted our spirits in readiness for the day ahead. The dreaded full English breakfast. It’s got everything. Clockwise from top left: black pudding, bacon, egg, mushrooms, tomato, potato (under the tomato) sausage, baked beans. 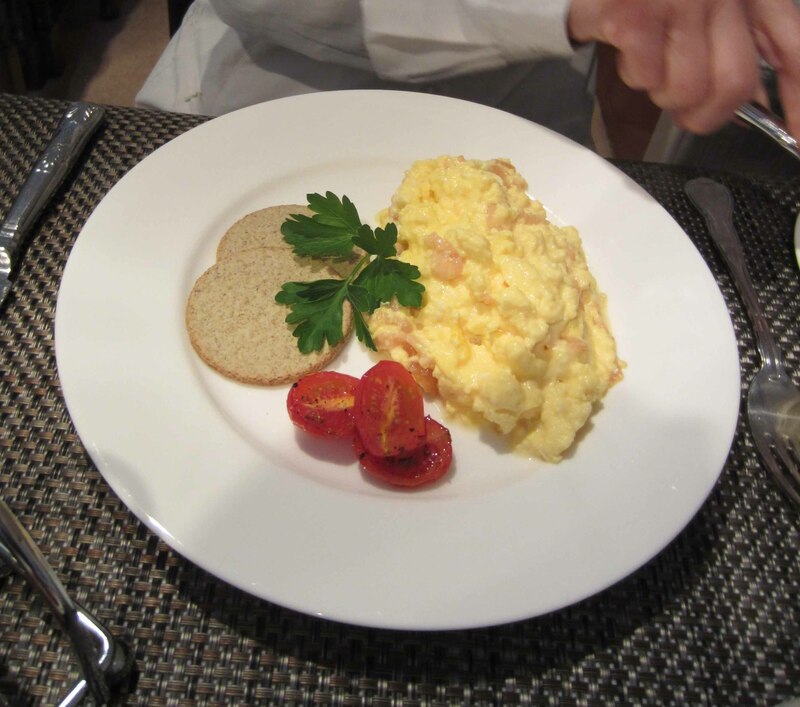 The more digestible option: scrambled eggs with (in this case) oatmeal cakes and cherry tomatoes. With our stomachs comfortably laden we rejoined the Pilgrims Way in the suburbs of Canterbury. It unrolled in front of us east towards Dover. We were heading away from Canterbury Cathedral, of course, so we were walking the Pilgrims Way in the “wrong” direction. But we were also walking the North Downs Way in the right direction towards its endpoint on the coast. We walked across many kilometres of empty, silent fields. The solitude was blissful. 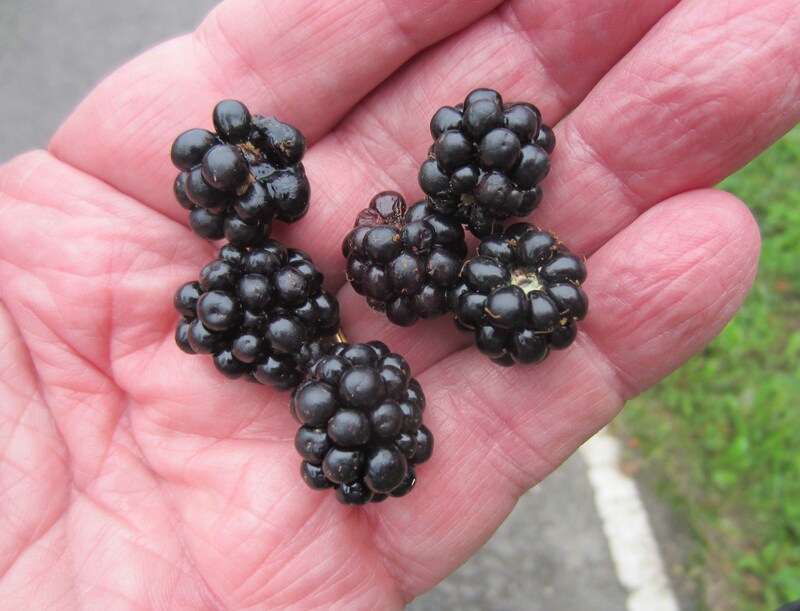 Sweet, juicy blackberries picked and eaten trackside. 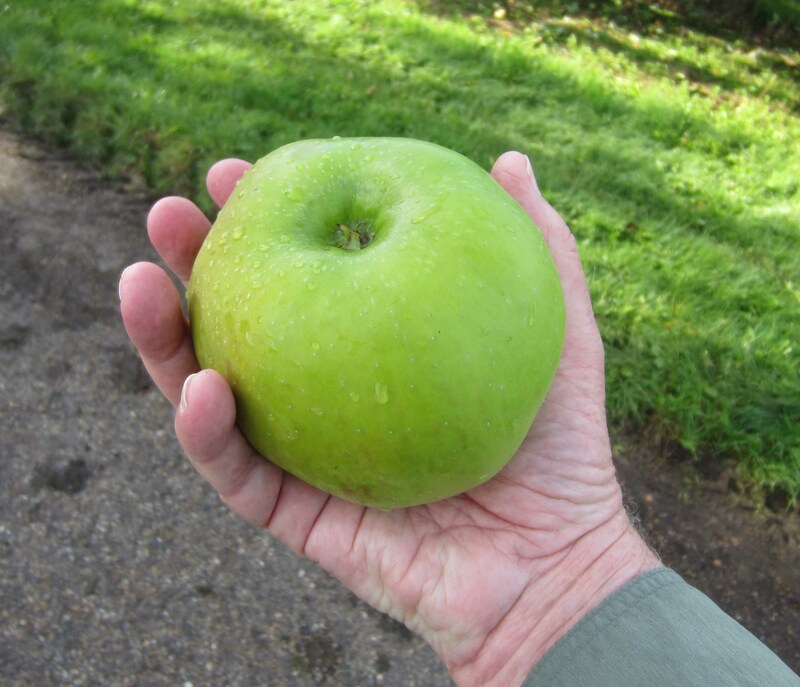 More trackside bounty: apples for the taking. The path took us through rich farmland. We gathered wild blackberries (juicy and sweet) and apples from trackside orchards (tart but edible). We tunnelled through fields of head-high corn and graduated into a wide-open, bare expanse of newly harvested land. 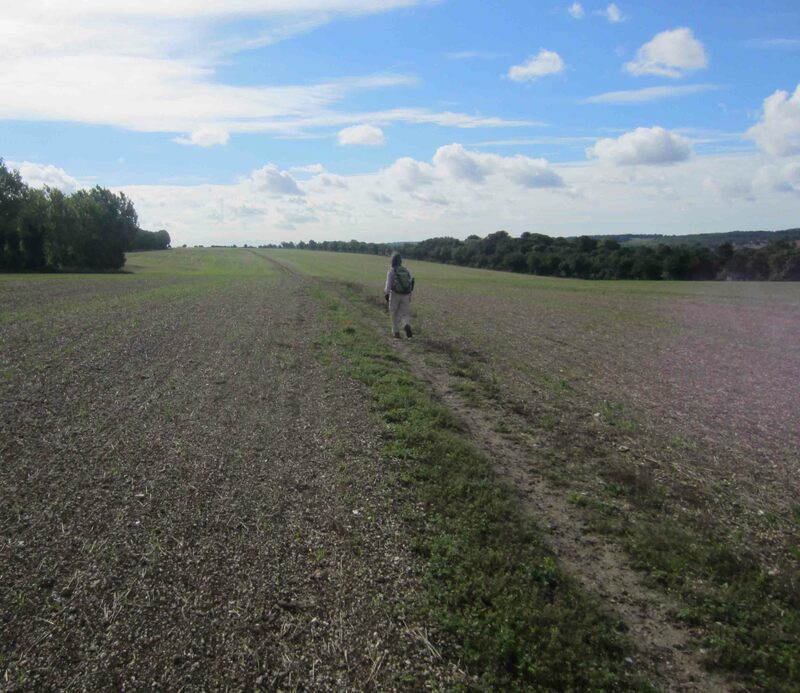 Between Canterbury and Shepherdswell – our stop for the night – we must have walked at least eight kilometres over tree-less fields filled only with stubble punctuated with the occasional hedge. Fortunately the sky was hazy and a friendly breeze fanned us. For hours we enjoyed one of the greatest rewards of walking – the profound pleasure of being utterly alone. In the village of Shepherdswell we had dinner in a tiny pub, The Bell Inn, at the side of a village green scarcely bigger than the pub. A small group of men and women, children too, and dogs, clustered at the bar which was within arm’s reach of the dining tables. I made a complimentary remark about a flea-bitten pile of hair on the floor that looked something like a spaniel. This triggered an outbreak of friendliness. The dog’s life story was told to us in great detail. In its twilight years the animal’s last pleasure was to come to the Bell Inn, sit under a bar stool and sigh heavily from time to time. How I envied it. But it was deaf and nearly blind, so when the time came to go home, its owner almost literally had to tap the creature on the shoulder. It staggered to its feet and crashed into the bar, then looked around, identified the door and zig-zagged towards it. Behaviour possibly adopted from human models. In the Bell Inn, Shepherdswell. Two dogs kept us company as we ate at the table on the left. The deaf and blind spaniel is snoozing on the right. 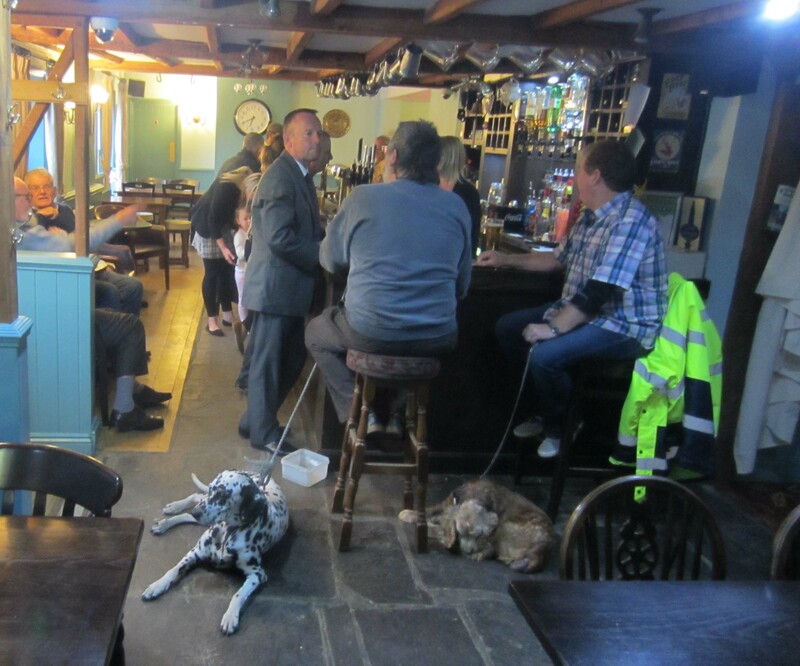 Note the little girl in her pyjamas standing at the bar (partly obscured by the gentleman in the grey suit). Meanwhile a menu had been scratched on a small blackboard. I ordered Chicken Masala at £9.80 (a bit over twenty Australian dollars). It took some time to prepare so I was anticipating a gourmet treat. When the meal arrived the chicken was “pulled” or shredded chicken in a brown barbeque-style sauce lying on a bed of greyish rice. Cautiously I lifted a forkful to my mouth. 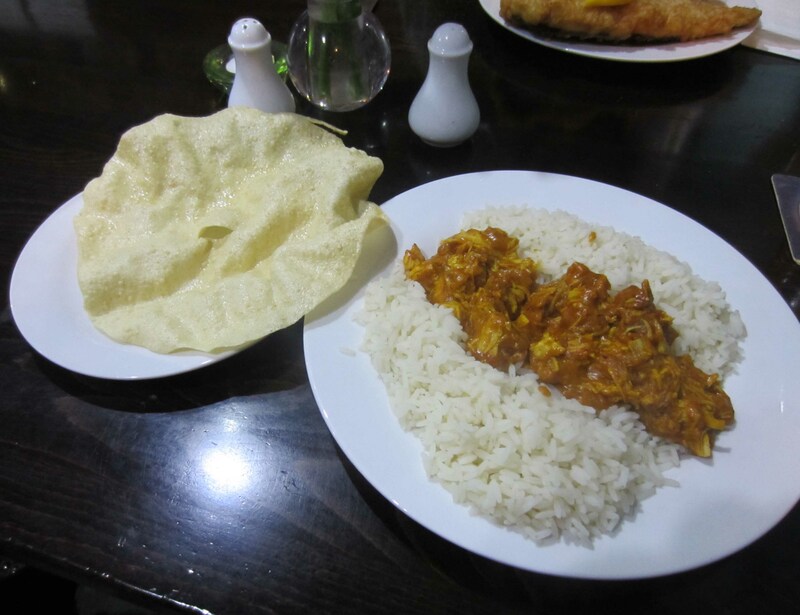 There was not a trace of any masala taste in the chicken and the rice was hard – not quite crunchy, but hard. And yet it was an Indian dish, because it came with a big crinkly pappadam glistening with oil. Chicken masala, English country style. The lady who had cooked the dinner emerged from the kitchen combing her hair and adjusting her horn-rimmed glasses. “Everything all right?” she said stopping at our table and looking down at my plate with unmistakable pride. “Mmmm, delicious,” I said. And indeed within minutes the chicken masala had disappeared, chased into my alimentary canal by a pint of cider. To be honest, once I had got over the initial shock and redefined the meal as not chicken masala but gastronomic Spakfilla, I quite enjoyed it. Walking does that for you… it gives you the gift of hunger, and the hungrier you are the less liable you are to quibble over little details like flavour and authenticity. What a relief to be free of all that and just eat. The following day was our last day of walking. We faced a downhill stretch of just twelve kilometres into Dover. The weather was warm, hazy and still. The walking was easy, mostly through farmland and stands of straggly trees. As we neared Dover the North Downs Way joined with a tree-shaded branch of Watling Street, the old Roman road that, almost 2,000 years ago, reached from Dover into the interior of the Roman province of Britannia. Today the segment we trod is no more than a track with none of the Roman paving stones still evident. We could hear a whispering roar just beyond the skyline and as we neared Dover it became insistent and intrusive. It was the sound of heavy traffic on the A2 highway, the asphalt Watling Street of the twenty-first century that carries much of Britain’s trade to and fro across the Channel through Dover’s busy ferry terminal. 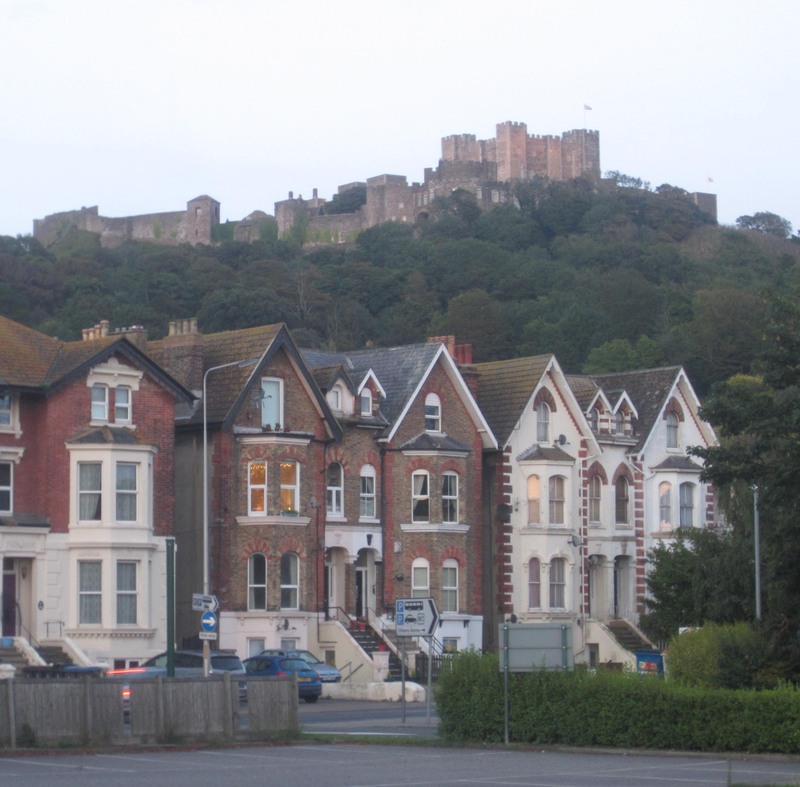 Dover Castle above the Victorian villas of Dover city. Our B&B was a similar building in the same street. After dropping our backpacks at our B&B accommodation on Maison Dieu Street we headed for the waterfront. Dover city has little of the hyper-buzz of the terminal. In fact – just between you and me – Dover feels dispirited, even a bit seedy. We stood in front of the dingy Good Luck Chinese Restaurant debating whether to dine there. We decided its name was probably a warning to prospective diners and moved on. But, as we discovered the following day, Dover is redeemed many times over by the medieval castle on the brow of the hill high above the city. There is much to see there. The castle’s tall central keep, called The Great Tower, was built by Henry II in the late years of the twelfth century. Today it houses a truly remarkable and very accurate re-creation of the royal chambers of the time, including a blazing open fire and the king’s bed. 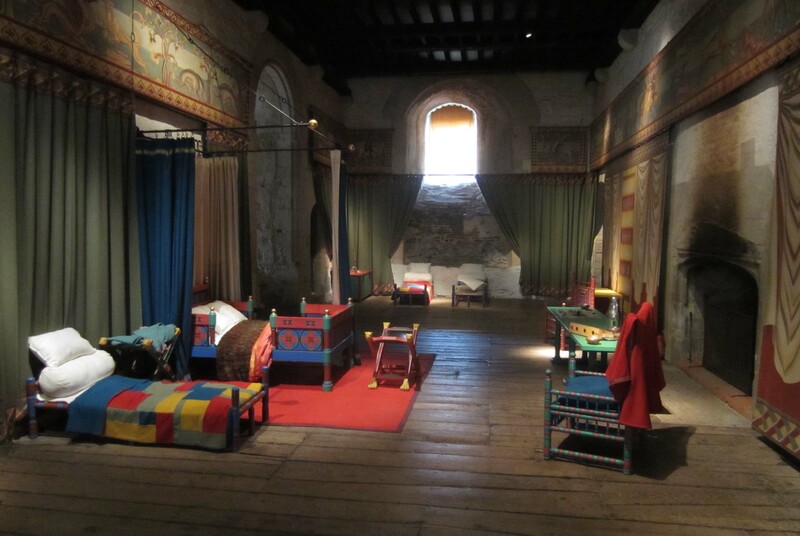 One of the beautifully restored twelfth century royal chambers in Dover Castle. 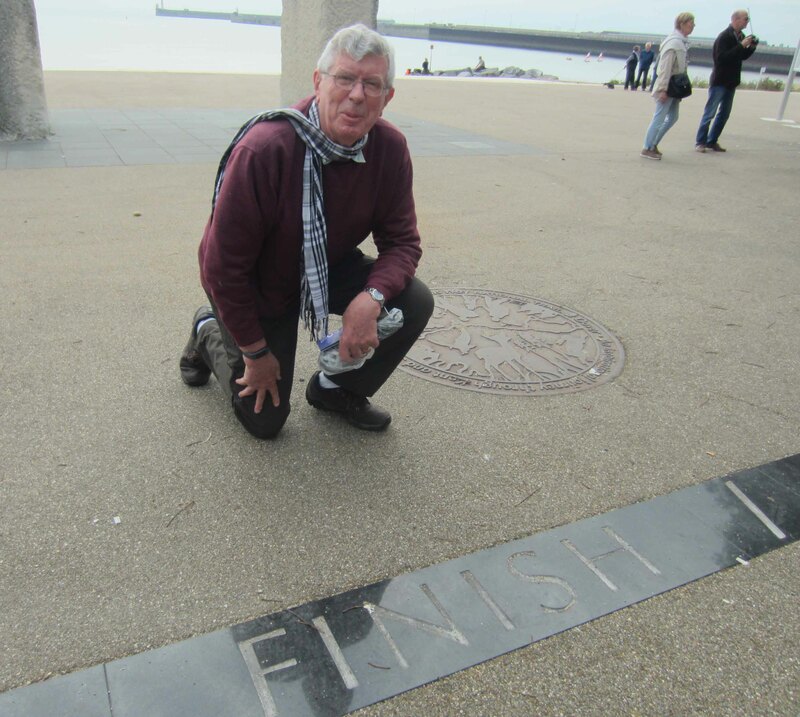 On the Dover waterfront, within sight of the famous White Cliffs, we found the official endpoint of the North Downs Way etched into a stone paver. We were pleased to have arrived, but a faint sea breeze of regret also ruffled our hair. Emmy and I walk because we enjoy it. We don’t push ourselves hard, we have no big targets, we don’t talk much, we like resting almost as much as moving. But when we walk, every step brings the anticipation of something new, maybe something unexpected, maybe something challenging, and always (sorry… usually) something enjoyable. Walking is something you can do on your own, in your own way, in your own time, and without too much fuss. And when you stop after a day’s walking – after the aches and pains, frustrations and fatigue have ebbed away – you get that fabled high, that mild sense of well-being that can last for days. We like that. On the Dover waterfront we reach the endpoint of the North Downs Way. This entry was posted in North Downs Way and tagged hiking, long distance walking, North Downs Way by George Quinn. Bookmark the permalink.